Views from the loch. : Some nice fish! 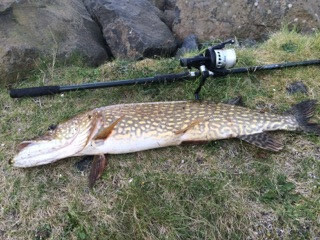 Over the last couple of weeks, there have been some very nice fish caught and the photos show that even in what historically is a lean spell fish do get caught! 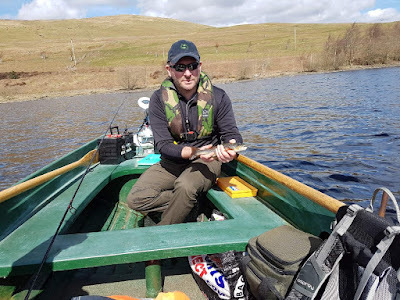 Photos show 04 shows intrepid angler Mike Wood with a very nice Brown Trout of around a pound which put up the customary struggle before coming to the net. Of course it goes without saying the fish was safely returned to the loch. Next up is our lure ace Davy Forsyth with a couple of super Pike. 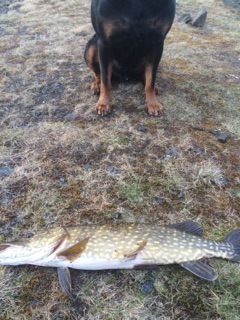 It’s likely that the spawning event is underwaywhen Pike often show little interst in feeding but Davy’s persistence paid off with a cracking 14pounder and a fish of around 8 pounds. The big one looks as though she has yet to spawn. Note how Davy’s pooch stands guard over the fish! So very well done lads! Yet again I have been sent photos of a recently cut Birch tree which had been cut down recently by persons unknown. This recent event took place on the Bowerhope road close to the fork with one road heads up into the hills and the other to Bowerhope. Now the banking is very steep here making the carrying of the cut wood up the bank an arduous situation indeed. So taking the wood on to the road is unlikely and since the cut wood has gone we must conclude it was taken down the banking! No one has camped anywhere near where the tree was cut meaning the wood was taken further afield by means of walking or by boat! 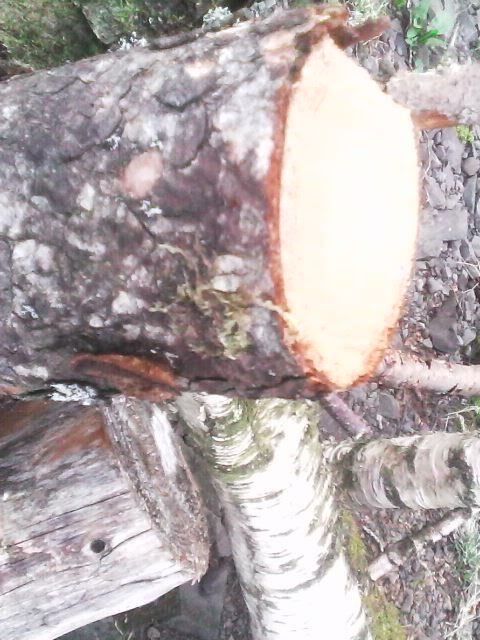 Photo 05 - Part of the illicitly cut tree! 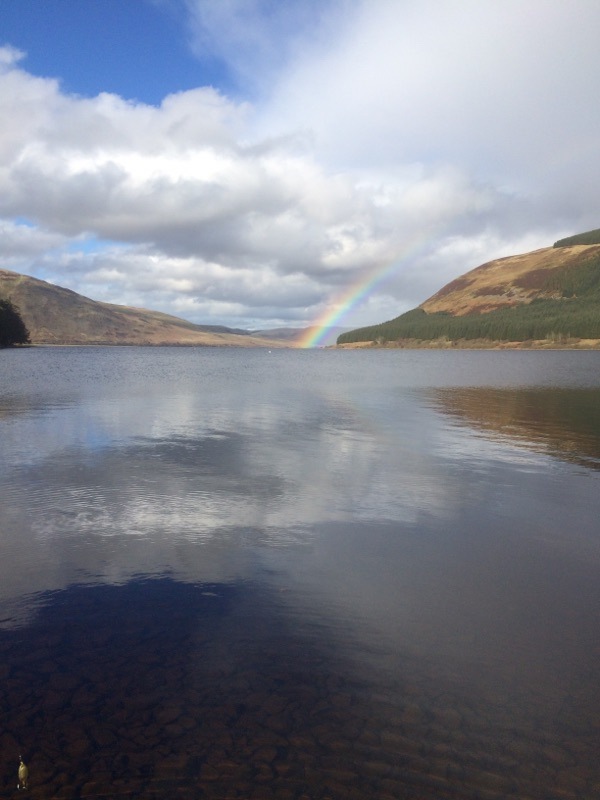 Now we have no evidence implicating anyone but visitors and members alike should consider the following – Any visitor found cutting trees will be barred from returning to the lochs, any member found cutting trees will have their membership terminated with immediate effect! We have a duty to the riparian owners to do all we can to prevent damage and we will do that! The lochs are an SSSI and the habitat must be maintained! Cutting down trees is highly irresponsible and is in fact theft! To the perpetrators I would say read the words above in bold type carefully and do not test our resolve, there is no mitigation for these acts of vandalism, action will be immediate! This is the type of incident that we envisaged working with the new warden to quickly detect the miscreants. However, there has been no contact with the warden or those who direct his actions! It has turned out to be a complete shambles and the time is fast approaching when I will wash my hands of the complete fiasco! We are the laughing stock of the world, what a comedown from the “glory” days of empire! The latest shameful episode, the Windrush affair points to both the Maybot and Amber Dudd exposed as mere charlatans. One blunder after another, lie upon lie sees them both apologising repeatedly but not from the heart simply empty words with no meaning! Both the Maybot and Dudd have subjected these immigrants to cruel life destroying measures! No amount of compensation can relieve their suffering, their lives have changed for the worse. Families broken up, a lifetime of living in this country abruptly ended by these twerps! If the Maybot and Dudd had any sense of propriety they would resign without hesitation! Honour, however, is an alien concept to Tories! On the Brexit front, it seems we are again embarrassed as the diddys “negotiating” on our behalf plough over the same ground time and time again rehashing words and phrases from over a year ago! And it took them forever and great cost was incurred only to have the Irish border proposal rejected as soon as it landed in Brussels! It is little wonder the EU is taken aback by the breathtaking ineptitude of our negotiators! You have to ask yourselves if it is possible to do any worse that the bumbling fools we have as our negotiators! They learn nothing, achieve nothing and come home happy with the crumbs from the EU table. It seems their incompetence knows no bounds! Its like a fantasy adventure where absolutely everything goes badly wrong! These Tories are going to do for us good and proper! They are cruel and heartless (think Esther McVile) stupid and confused (think David Davies) arrogant and incompetent to the nth degree (think the Maybot and Dudd) bewildered and unrealistic (think Liam Fox) and clueless and cringe-worthy (think Boris Johnston)! No country deserves such a shambolic crew but we are lumbered with them! To think the 12 Tory duds in Scotland are what got them elected, we as Scots have some soul searching to do! Countries do make mistakes but war events aside, the 12 constituencies that elected a Tory have much to answer for and yes to my eternal shame, I live in such an area. I doubt I will ever get over this black time where we see the poor hammered at every opportunity and the rich loaded with even more wealth! All people want is a competent government capable of speaking the truth with the resolve to rid the country of massive inequality, the last eight years would suggest that this is not possible! They say we are an equal civilised society, with the country being led by incompetents, liars and fools I would most strongly beg to differ!